Studio J: Photo Editing is Fabulous! This paper kit, called Expedition, is one I have never owned, and I’ll now have a layout made with it! I had a lot of photos that were taken farther away from the subjects, so as I dropped each photo into a well, I zoomed in. I prefer to do this kind of thing right in Studio J because then I know the photo will be cropped perfectly to fit the size and shape of the photo well I choose to put it in. The other thing I did in the layout was to change a photo well to a text spot and vice versa. The journaling was supposed to go in the bottom right spot, but I really wanted that photo, with all our Blast friends, to go there. A simple click on those two spots and that’s done. Love that, too! This kit is perfect for all those zoo photos, that I’m sure so many of you have. What is it about the zoo that makes us take so many photos? I always have way more than I can ever use! These were all taken at the Peterborough Zoo. It’s my favourite, even though it’s not very big. It’s the only free zoo left in Canada. It has a fabulous playground, great animals and a fun little train that only costs $1 to ride. It’s also the place of some of my favourite childhood memories. What is your favourite zoo? Where do you love to go with your kids or grandkids? Leave a comment and let us know! 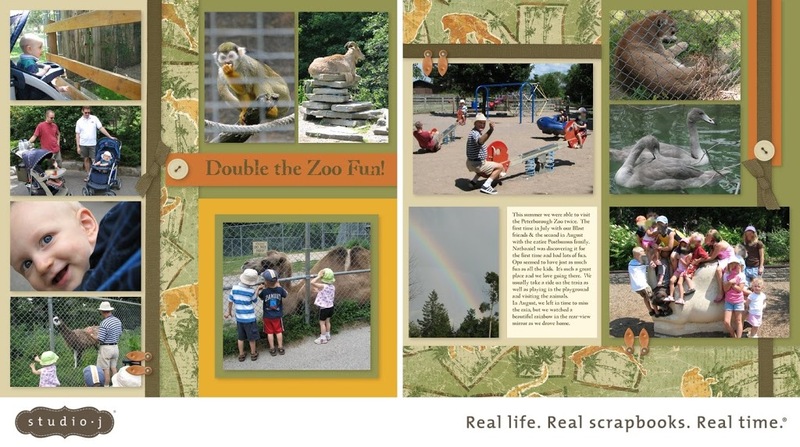 Then head on over to my website to create a layout about your latest trip to the zoo.